Intro to Math by Montessorium is a math app designed for kids who just start learning about numbers and gaining the basic concepts of the numbers. It is a series of lessons following Montessori method, but is packaged in a game-like setting that is very engaging. Since all activities are hands-on, you can think of it as hands-on Montessori math games for preschoolers. When kids start the app, they will see 6 blocks on the open screen, each leads to a different activity. In this interactive exercise, kids are asked to place the red rods in order based on their length. Kids will come to understand length and how it is related with numbers. Kids count number of units in each rod of various lengths, and are asked to choose the rod corresponding to a number. It starts with rods with 3 units, all the way to 10 units. Kids will learn the idea of quantity, and demonstrate how it corresponds to numbers. Kids are shown each number and how to trace them, then they need trace each number. Kids learn to recognize the symbols of the numbers, and how to write them. There is another block leads to a similar activity, and kids can take the tracing guide off the screen, so they can have clean look of what they have written on the screen. Completing the cycle of 1 through 10, from the symbols of the numbers back to their quantity. Kids will learn the sequence of each number. Kids will be exposed to odd and even numbers, which will strengthen the understanding of the number sequence. The interface of the app is very clean. The lessons are all hands on, so kids will not get bored easily. Although each lesson has many repetitive elements, because of the different activities, kids can stay engaged for a quite long time. Like most Montessori approach, Intro to Math does a wonderful job in bringing the abstract number concepts to life using hands-on game like activities. It makes these number concepts easier for kids to relate to and understand. While playing the games, kids not only learn numbers, they also gain critical thinking and reasoning skills, as well as fine motor skills. 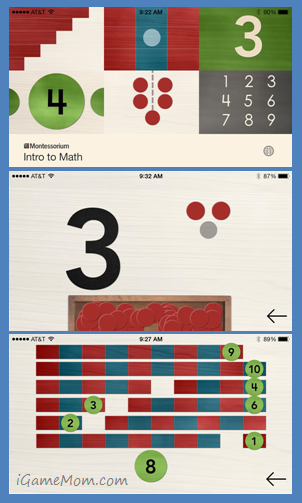 It is a well designed Montessori math app you don’t want to miss. Intro to Math works on iPhone, iPod and iPAD. It is usually $4.99 on App Store, it is free for limited time.